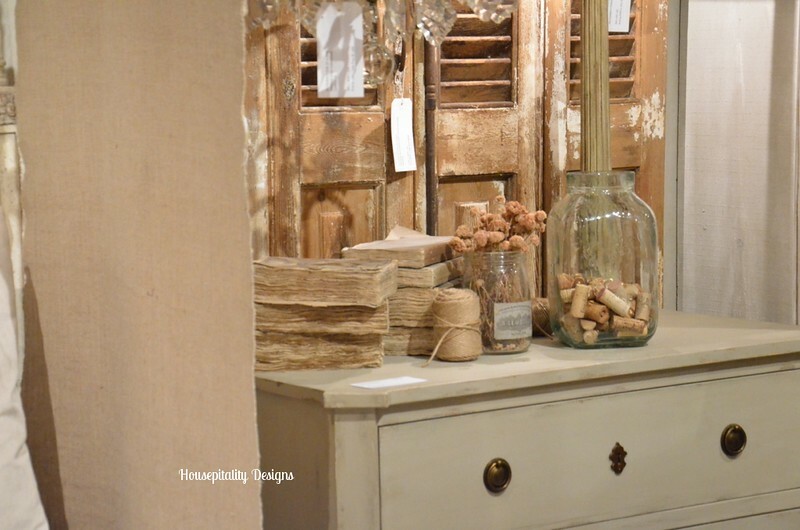 …..with Kristen of Sophia’s Decor and her talented mom, Linda. We did lots of walking and gawking in the one day we were there. We ran into the lovely Courtney (French Country Cottage)…and due lots of miscommunications, etc. …..we did not get to actually hook up…next time! ….. that Kristen and I love…Eloquence. 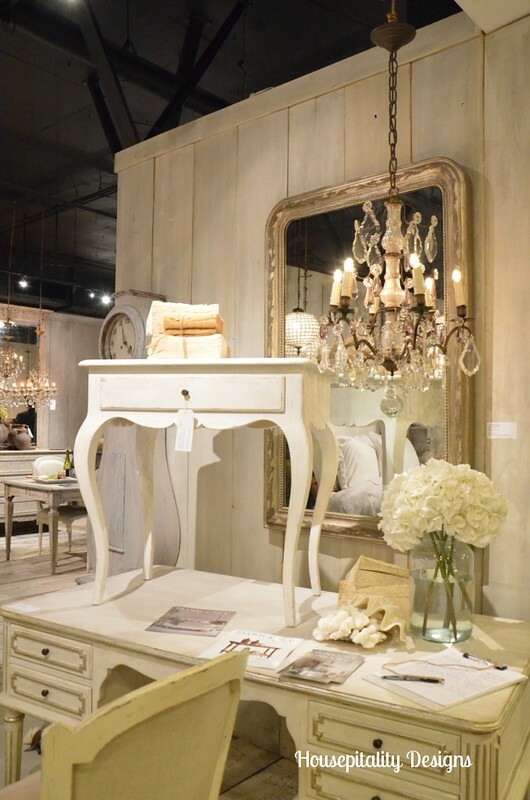 The antique and reproduction furniture is magnificent! 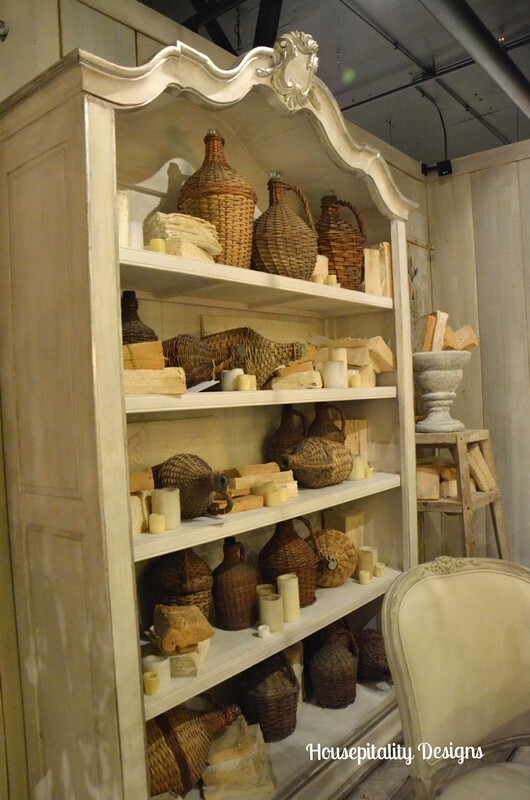 I love the styling of this cabinet…lots of demijohns and de-constructed books.. Wanted to take that beauty home!! …..rooms decorated with olive bucket decor, demijohns, and deconstructed books…are here to stay. 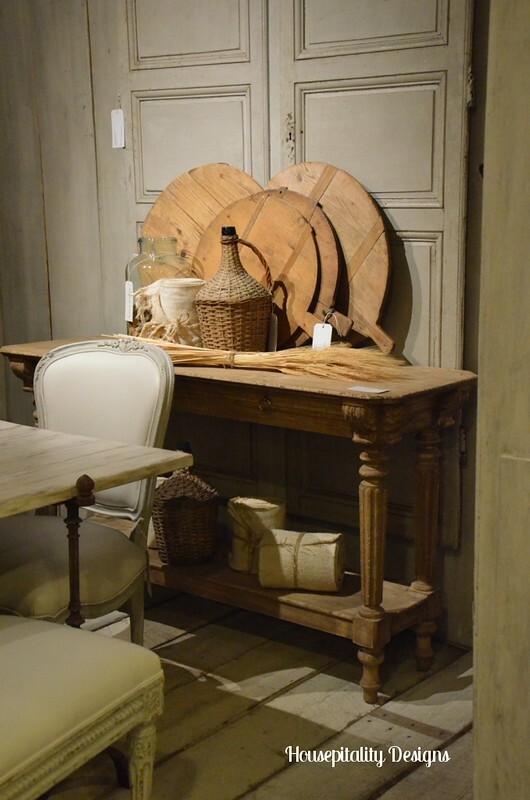 …………..glorious antiques and vintage furniture mixed with quality reproductions. And one of the highlights of the day…was attending a session with Candace Olsen. What a beautiful, talented and very funny lady!! 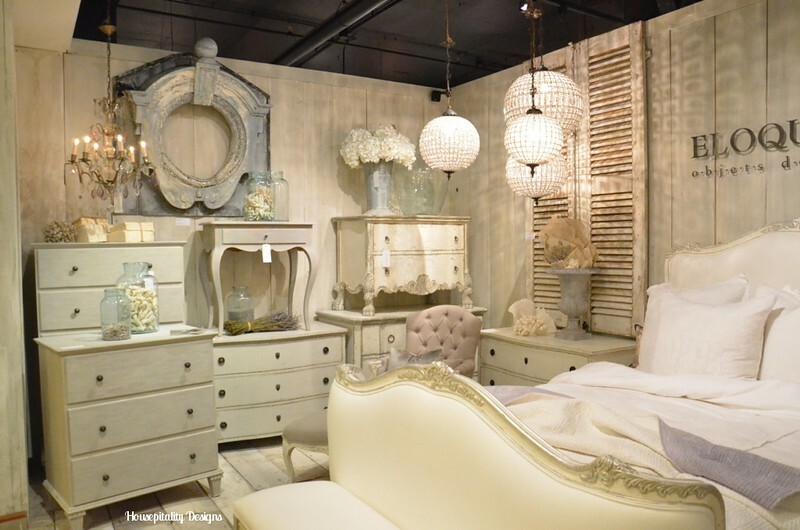 Love this line of furniture! Looks so Frenchy. I was thinking about you going to this market. Love, love, love the Eloquence space you are sharing. So much goodness in one place. And, speaking of love, Candace. She and Sarah Richardson are my favorites. I heard Sarah was there yesterday (Monday) on a buying trip…oh missed her!! I would have been in heaven,I love Candace Olsen. What a treat Shirley. I have so many friends that go to High Point! I am just thrilled to get these reports back. Beautiful vendors and companies! How beautiful. Every piece is so great. 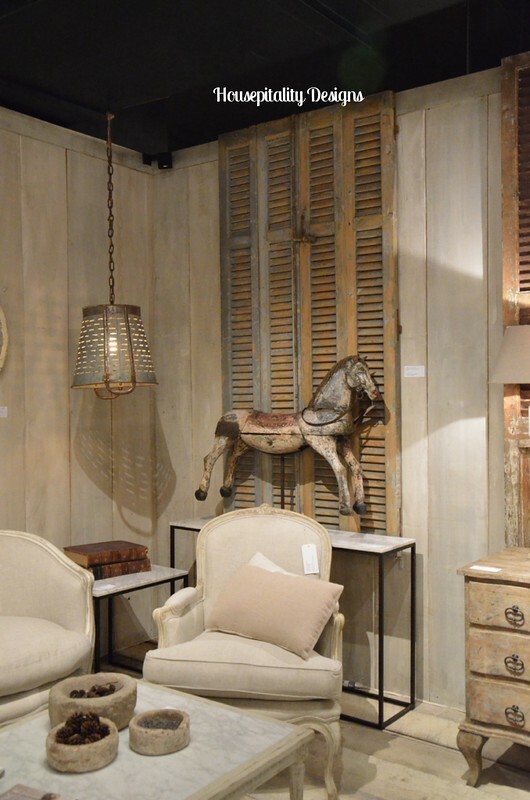 I just hung brown distressed shutters like those in my guest room. I love that style. So pretty. I bet you had a great time looking at all the vendors. I would absolutely love this opportunity. We went through High Point several years ago on the way to Maine, but many of the showrooms were closed. I did find a couple of treasures though. 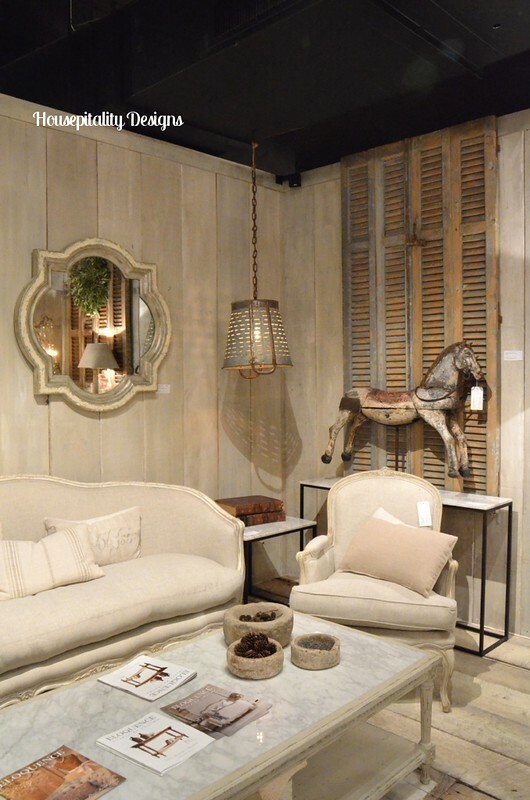 Everything looks so lovely, and those beautiful shutters seem to be calling my name! Tracey Steele’s recent post…The Stylish Cherub. Amazing displays. How fun to hear candace o. I am going nexy time! What beautiful items to look at. I can’t believe how gorgeous some of them were. Fun that you got to see Candace! lots of eye candy here…..thanks for sharing!!! What a fun trip, Shirley! 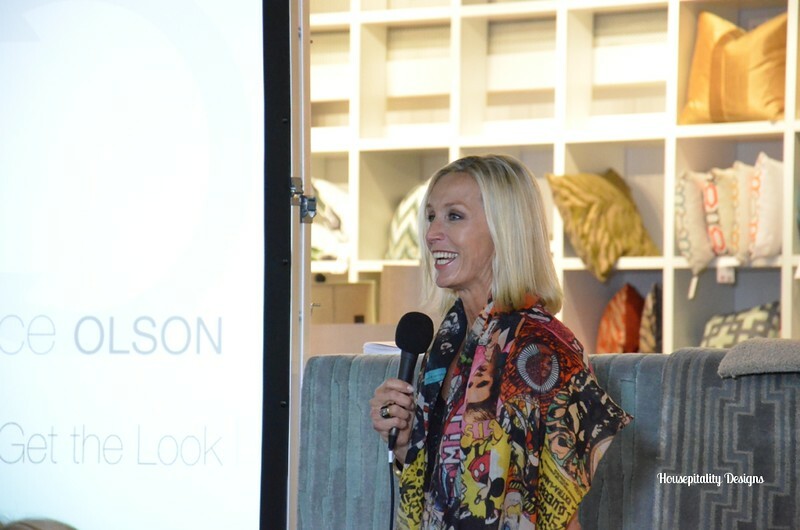 Gorgeous things and Candace Olsen?? Lucky! WOW Shirley would I LOVE to shop there!! 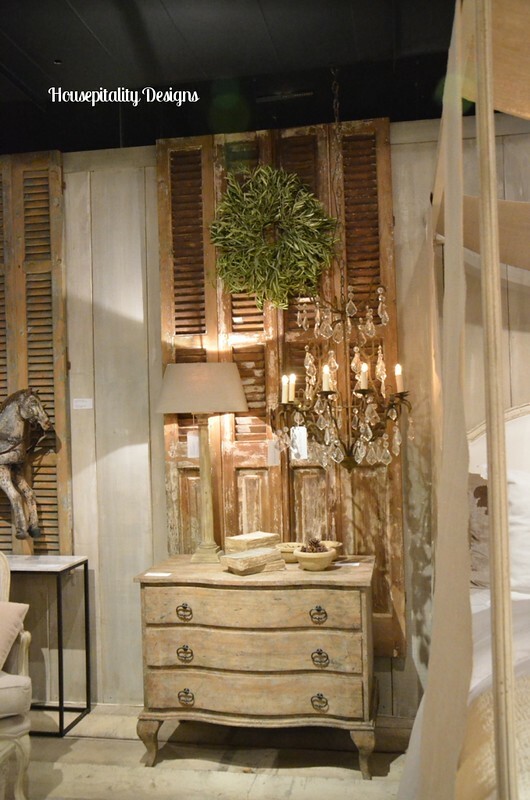 I so want those old doors for behind my living room sofa(the ones with the wreath hanging from them)! What fun! 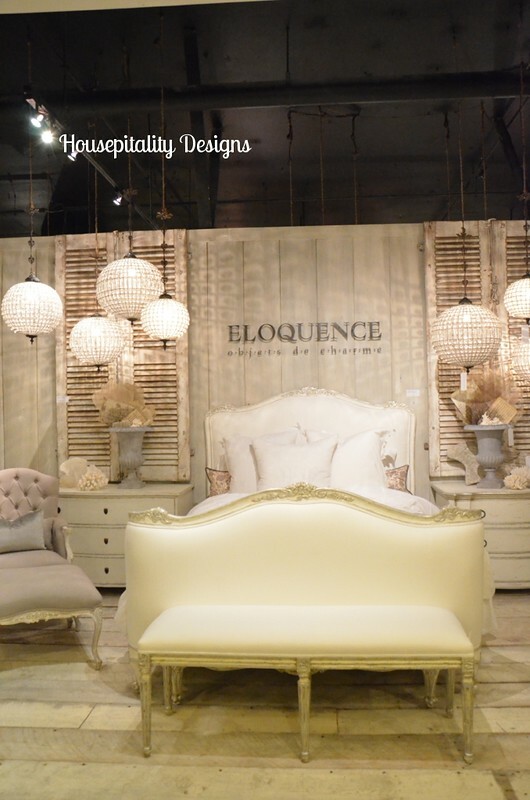 Eloquence has some beautiful furnishings and to see Candace Olson too…love her show! Eloquence is always a favorite! I had a great time with you this last weekend…thanks for coming along with Mom and I! Wish we had more time to get past the third floor…maybe in the Spring? Oh how exciting to have seen Candace. She looks really skinny in these pics, as in even skinnier than usual. Lovely woman. Sounds fun and how nice to spend the day with Kristen and her Mom. Me and Suzy were supposed to have gone but with the flu I just didn’t feel up to it. Would love to have seen Courtney again. 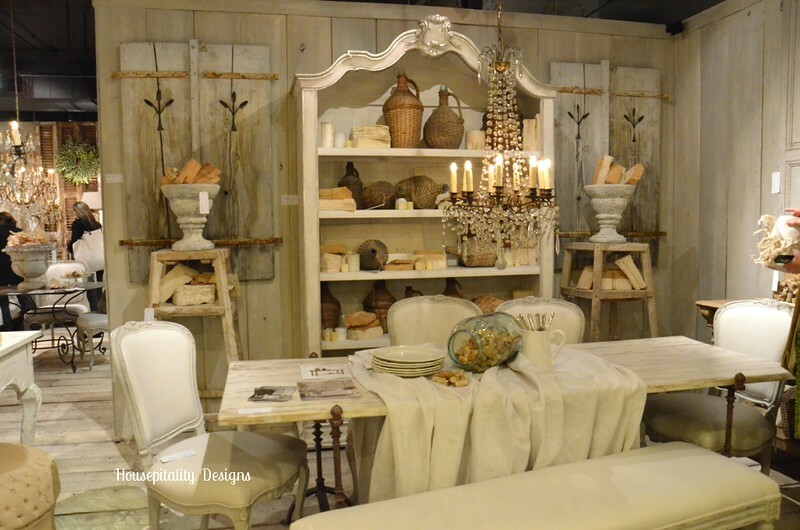 What a gorgeous showroom! The thing I miss about retail the most~ shopping Americasmart in Atlanta! It’s been years since I’ve been to HP, I grew up there and had lots of jobs working as temporary help passing out literature etc. for market. 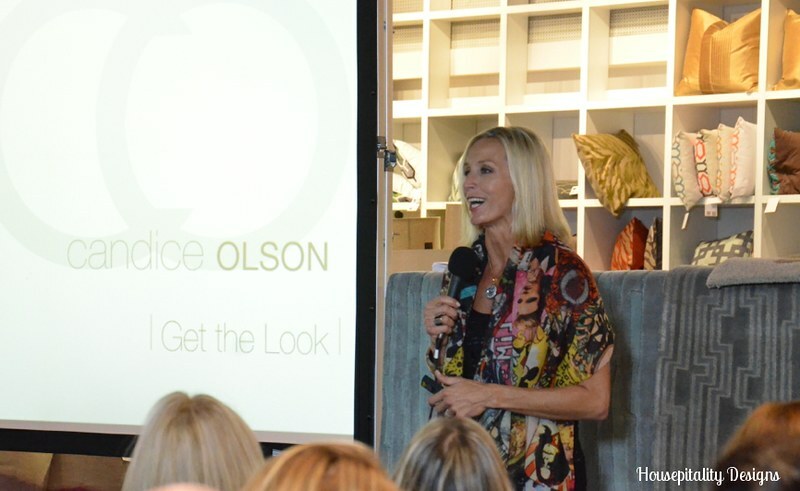 How fun you got to see Candace Olsen too! Beautiful photos of beautiful spaces + furnishings. Great job “reporting” your findings for those of us that didn’t attend. This makes me want to redecorate my whole home! So so beautiful. What a fabulously wonderful day you must have had! Thanks for letting me go along with you. Did you bring anything home? So lucky! I would have loved to have seen Candice Olsen! GUESS WHAT????? Shirley, YOU ARE one of the TEN winners! information! Just need your address. Sigh, so pretty. Love all the muted color and texture. Very nice! What a gorgeous show! 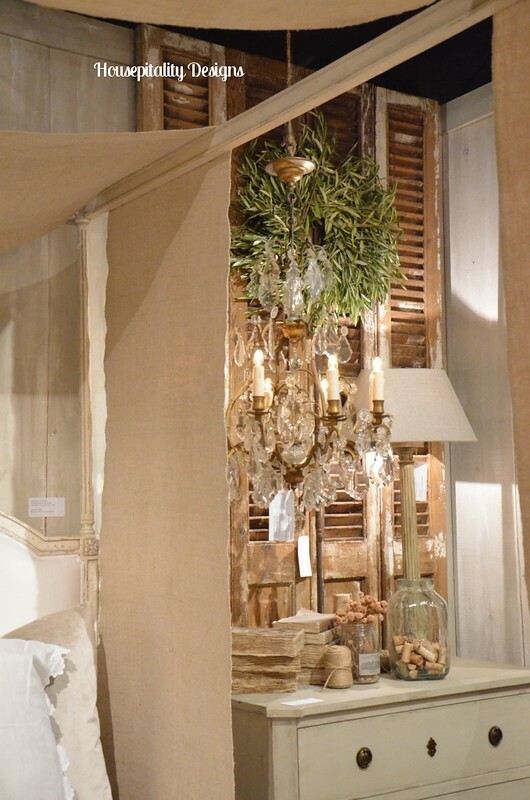 So many fabulous displays and beautiful decor.